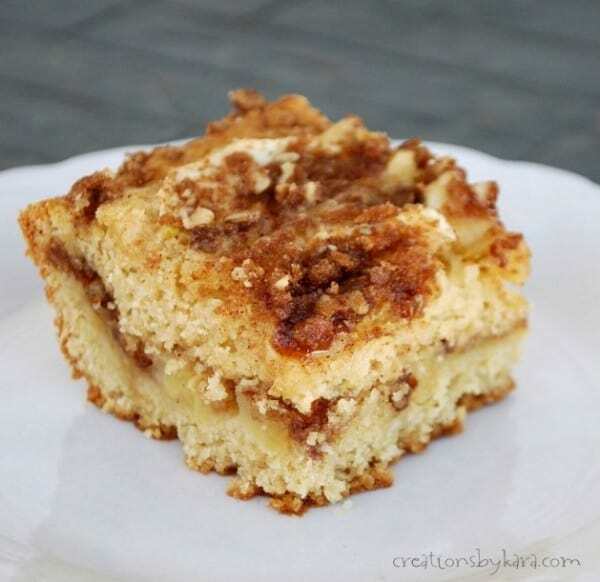 Cinnamon Crumb Apple Coffee Cake- A tasty breakfast treat that fills your kitchen with an amazing spicy aroma. 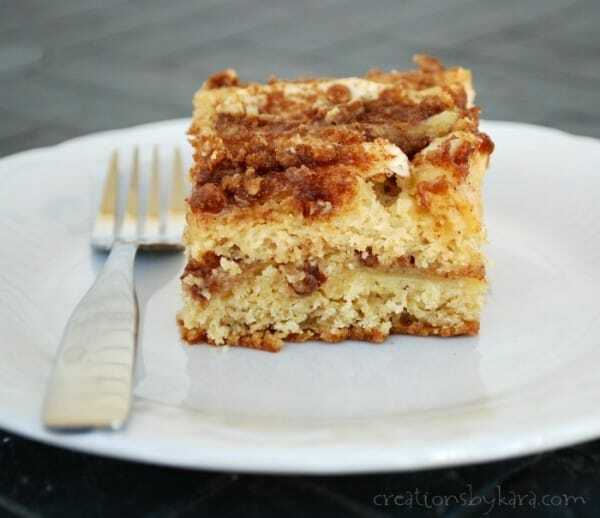 Apples and cinnamon just go together, and they pair perfectly in this tender, buttery coffee cake! Who’s ready for fall baking? I know I am. I love apples, pumpkins, cinnamon, and all fall flavors! 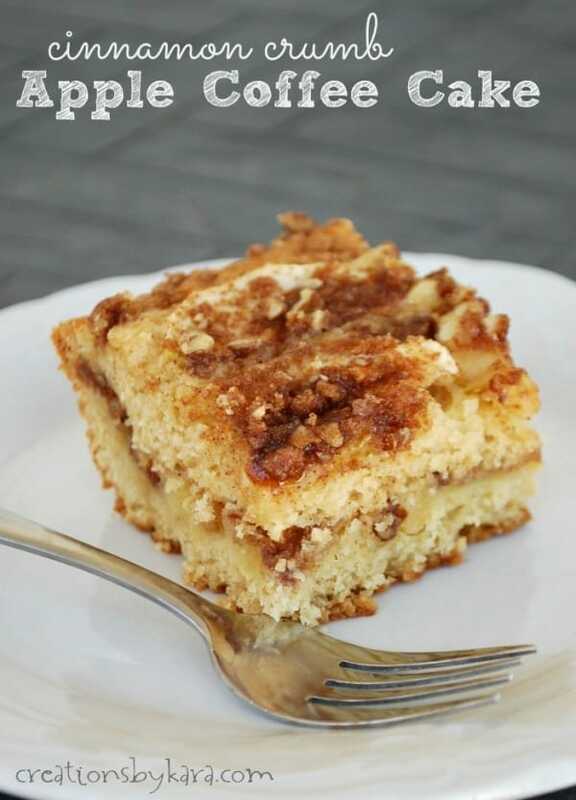 I adapted one of our favorite coffee cake recipes to come up with this recipe. The apples in the middle add a great tart flavor to balance the sweetness of the streusel topping. And they add some extra moisture too. So very yummy! My family finished off an entire pan of this stuff in one sitting. 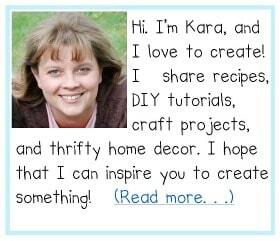 This recipe is sure to be a hit with your family and friends!! Who doesn’t love cake for breakfast? Mix streusel ingredients in a small bowl till crumbly; set aside. Cream sugars and butter; beat in eggs, then milk and vanilla. Stir in dry ingredients. Spread half of batter in well greased 9×13″ pan. Sprinkle with half of crumb mixture. Arrange apple slices evenly over the crumbs. Drop remaining batter in spoonfuls on top of apples and spread as evenly as possible. (It’s OK if there are a few small gaps, it will fill in as it bakes.) Sprinkle remaining crumbs on top. Bake at 325° for about 60-68 minutes or till toothpick comes out clean. This was great! Easy and delicious! So glad you made and enjoyed it Elle! Looks delicious… I was just picking the apples from our tree that are finally ready and we ate up all of the applesauce before Jared even came home. I’m trying this for breakfast.